The pixels of Bill O'Connell's e-mail from MorningStar Audio Import slowly dried on my 19-inch Mitsubishi Diamondtron computer screen. 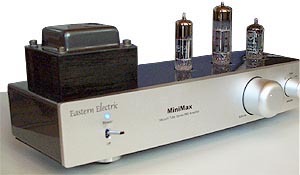 Would I or one of my writers be interested in reviewing the Eastern Electric MiniMax tube preamp, which he distributes in the US? I'd never heard of the brand before. After perusing the attached URL, I greedily decided to exercise being boss. I snatched up this promising assignment myself. Snooping 'round the Internet, I had chanced upon a published letter to SoundStage! Editorial. 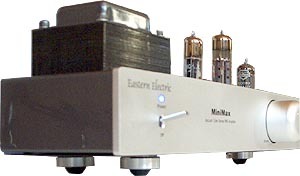 One Joe Mudry, proud owner of an ARC 100.2 amplifier, had his Audio Research dealer recommend a MiniMax -- outfitted with NOS Sylvania, RCA and Tungsram tubes -- rather than the matching SP-16 ($1,995 in line-stage version) or LS-25 ($5,495) preamps. I scurried back to O'Connell's introductory e-mail: $1,195 for the MiniMax. Hot damn. Unless Mudry's dealer was deaf or endowed with a saintly impulse to sacrifice profits, this indeed boded well for the mighty ambitions signaled by the name of today's über-dwarf. Bill wrote further that I had a set of stock GEC 6X4 rectifier and two Chinese Shuguang 12 AU7s coming, as well as an optional Tungsol 6X4 black/silver-plate "big wavey" rectifier; an E80CC Tungsram for the central buffer socket (not a direct replacement for the 12AU7 but safe to use -- and by design -- despite drawing twice the current); and one of the famous Mullard 12 AU7 D-getter K61 for the far-right gain stage. He'd picked these three upgrade tubes as promising to be especially mahvelous in my system. Awaiting delivery, I requested some background. I learned that Eastern Electric is a joint venture between US-based Bill O'Connell and Hong Kong-based electrical engineer Alex Yeung which began when O'Connell met Yeung in the cyber world and eventually ordered one of his 5wpc MA-1 amps with RGN2504 rectifier and 6L6 output tubes. It's an amplifier which Bill to this day sees as the best he's heard yet. When Yeung developed a matching preamp, Bill put himself on the waiting list, only to eventually observe it smoke his treasured $6,000 SOTA preamp. Performing due diligence with the dealer who'd sold him said piece, he received flabbergasted and somewhat embarrassed confirmation. His new acquisition, the dealer mumbled, was indeed as winning a ticket as he already believed. Based on further beta-testing, Bill soon convinced Alex to formally go into production. His partner traveled to mainland China to identify the proper firm that would build the unit to his specifications and cosmetics. Each resistor, cap, hookup wire strip, the power supply choke and transformer, have been chosen after extensive listening sessions. Those included members of Hong Kong's Tube Club who regard Yeung as a rare golden ear. O'Connell took delivery of his first 200 units this March and has been traveling the country since to introduce the MiniMax to dealers. 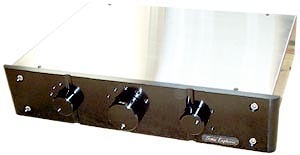 A matching amplifier is nearing completion and is expected to land in the US by October, while Alex is already working on a tubed CD player to round out the offering. Unpacking the unit, I marvelled at its unexpectedly petite size (4.2" deep x 12.5" wide x 4.75" tall). I instantly admired its tasteful chic. There was the clear-anodized silver faceplate -- thicker in the center than towards the sides for a gently contoured horizontal swoop -- mated to a glossy anthracite on the chassis proper, a finish I've also seen referred to as black chrome. 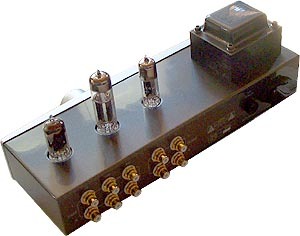 There was the becoming Zen-like simplicity: Upfront, a power toggle with miniature blue LED to the left; a chunky, beautifully contoured, smooth-action non-stepped volume control off-center to the right, flanked by a smaller and shorter 3-position selector; atop, a black transformer and three in-line tube sockets with silk screen tube type identifiers; aft, three RCA line-level inputs, two RCA pre-outs, fuse socket and IEC inlet; on the underbelly, three silvery and circular metal footers with centrally embedded Sorbothane balls. "This is bloody cute", I thought to myself before noting a heft entirely unbecoming for its diminutive proportions. Flipping this pup on its back for a peek under its navel, I was greeted by super-tidy point-to-point wiring, solid silver buss bars, Rifa caps, the power supply smoothing coil, an ALPS pot as well as a miniature PCB mounted vertically right behind the twin pre-outs. As the exterior had already suggested, MiniMax was a class act all around. Meanwhile, one Jeff Hagler of Jeff's Sound Values got bored with the permanent sun of San Diego/California. 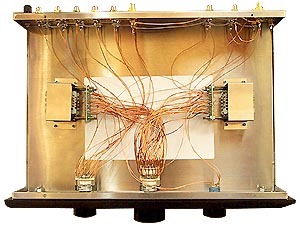 He decided that rather than heat, budget-conscious music lovers really needed autoformer-based attenuation without any capacitors or resistive loading in the signal path. Enter the Sonic Euphoria PLC. Its design objective? Affordable transparency without the usual drawbacks of passive linestages. 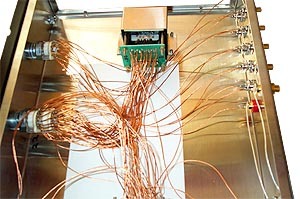 Removing the lightweight folded stainless steel cover unveiled a California-style freeway crossing of copper-colored lead wires connecting the discrete-channel autoformers to the 24-click rotary Elma volume switch. Other flying leads are running to the 2-position fine/coarse 0.9/1.8dB step selector while the 6-source input selector runs its leads to the chassis-mounted RCAs, one pair of which is a top-line WBT. One tape loop, two pre-outs (one with equivalent WBT jacks) and one port for the included banana-fitted active ground lead complete connectivity on the business end. Retailing direct for $1,195, the PLC can be optionally outfitted with upgraded terminals, captive interconnects, remote control and Black Diamond Racing cones. It can also be converted for complete balanced operation ($1,795). First shown at HE2003, the prototype's clear-anodized ½-inch face plate is now anodized black while the very chunky, luxo-action knobs sport embedded chrome ball markers to verify setting. 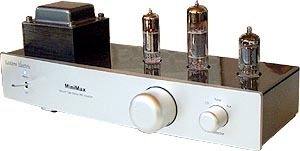 Autoformer attenuation has long since been a known underground recipe for the ultimate in preamp transparency. 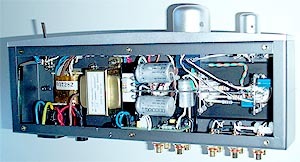 Variants like Swiss Audio Consulting's famous Silver Rock employ actual transformers with precision-tapped secondaries. One advantage of autoformer attenuation is the increase in current as voltages are reduced. This is said to offer more raw drive and dynamics -- even at significantly reduced outputs -- than traditional resistively-loaded passive preamps are known for. In other words, proponents of autoformers feel they're the cat's meow. Still, commercial applications in full production units are rare - precisely why Jeff Hagler perceived an unfilled hole in the affordable segment of the audio enthusiast market and decided to do something about it. Compared to the MiniMax, his PLC doesn't offer quite the same refined level of fit-n-finish. Sonic Euphoria's stainless case work is somewhat on the flimsy side and could benefit from thicker sheet metal. The initial labels rather than silk screening on the rear telegraphed small hand-built production runs but Jeff informed me that he'll improve the label appearance. The purist concept per se plus the top-notch parts quality of the terminals, switches and internal wiring all spelled best possible performance for the dollar. In short, prospective PLC owners won't pay for audio jewelry and armored tank construction but functionality, comprehensive while partially optioned features and tweaked sonics - exactly the kind of performance-driven, budget-constrained shopper Hagler had in mind when launching his Sonic Euphoria project. Time to wear my hearing aids, take today's contenders around the block and determine how same-priced tube versus passive preamplifiers would cut the mustard, dice the tomatoes and grate the cucumbers. Musical vitamins, you know?